Where there’s glamour (the Geneva motorshow is held just a stone’s throw from the beautiful lake) there’s money, and where there’s money there’s usually a Ferrari. 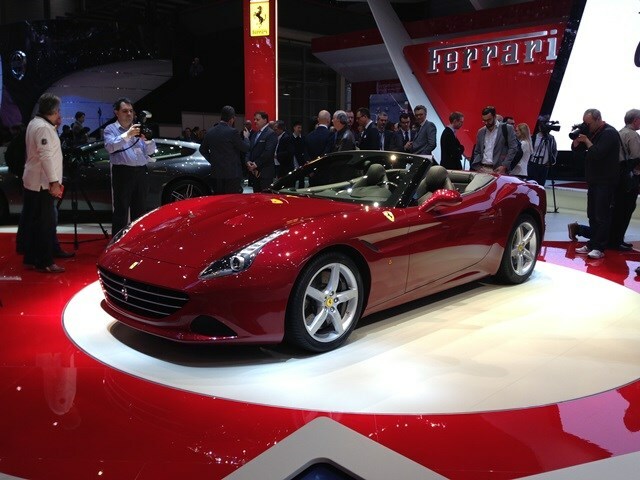 And so the phenomenon continues with the Ferrari California T at Geneva. Fighting for its share of the motorshow limelight the new California T isn’t just a mild facelift of the firm’s under-achieving California, like the name might suggest; it’s a comprehensive update. First and foremost is the new engine, a 3.9-litre turbocharged V8 with over 550bhp and 755Nm. Built to satisfy demands on emissions, the firm claims there’s no turbo lag (citing some Formula One technology developments) and the California T can sprint from 0-62mph in 3.6 seconds. The turbo-traditional flat torque curve has gone thanks to new boost management and the firm promises an almost naturally aspirated power delivery as the revs increase. A Turbo Performance Engineer sits between the central airvents (sadly just a multifunction screen rather than a small Italian spanner monkey) and displays relevant engine information on the move. Changes to the steering box, springs and adaptive Magnaride suspension ensure the California T is sharper to drive than before. The latest ESP system (version 8.0 premium don’t you know), F1 Trac traction control and CCM3 carbon ceramic brakes can reign it all in should things go pear-shaped. Fold back the hard top roof (in 14 seconds) and the California T looks better than ever, thanks to some meddling from Pininfarina – though we’re not sure about the nomenclature of the 'Triple Fence' rear diffuser. The interior gains a new 6.5-inch infotainment touchscreen too and the leather of the showcar is a special Frau semi-aniline finish. Oh, and if you have to ask the price, well, you’re at the wrong motorshow stand.